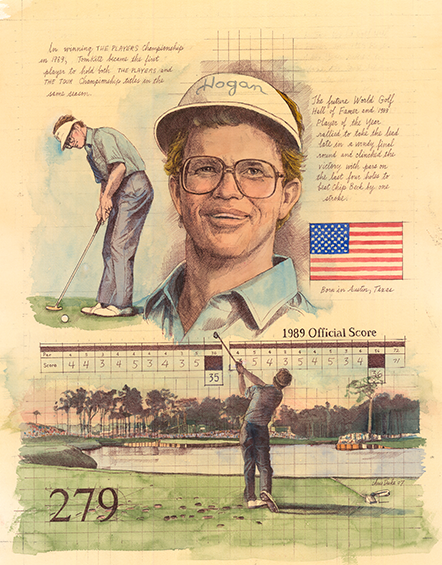 Everything about the bottom line to THE PLAYERS Championship 1989 had a consistency to it that made sense. The deepest and toughest field of the year was won by the season’s best player, Tom Kite, leading money-winner ($1.395 million) and Player of the Year. But what might have caught some by surprise was how the 39-year-old Kite finished at 9-under 279 to win by one over Chip Beck and hold off a list of challengers that included Jack Nicklaus, Fred Couples, Greg Norman and Bruce Lietzke — by going wildly bold when it appeared that safe and conservative would have done it. In possession of a two-stroke lead, Kite hit a 4-wood from 210 yards up and just off the green at the watery par-5 16th at THE PLAYERS Stadium Course at TPC Sawgrass. “That’s as aggressive a shot as you can hit,” said Lietzke, Kite’s playing competitor, and Norman conceded that he shook his head. Kite felt that if people were surprised, then they clearly had a misconception about the guy who was then the second highest-ranked American in the Official World Golf Ranking. Yes, he was small in stature and relied upon accuracy and not power, but that didn’t mean Kite wasn’t a tenacious competitor who could assert himself when needed. “I had a golf tournament to win,” he said, when asked why he went for the green with a 4-wood. And win, he did, the 12th of his career, though this one had a brighter shine to it, coming against the best field in golf at the Stadium Course. A final-round 1-under-par for Texan Tom Kite saw him overtake overnight leader Chip Beck to capture a one-stroke victory, and claim the title. With conditions tough all week, swirling winds at TPC Sawgrass made players work for every birdie. Beck, playing with Kite in the final grouping, learned that from early on Sunday as he bogeyed three of the first four holes and watched his lead disappear.